“His face is at rest, eyes closed and sunken, lips slightly parted; his hands lie in his lap, while his knees and head are tilted up — like a man who has just drifted off to sleep in his hammock. Visitors tend to tiptoe and lower their voices. A two-inch beard covers his face … Here and there white hairs glint among the yellow-brown, betraying his age — somewhere past 50. He would have been an imposing figure in life, for he once stood six feet six inches tall.” So writes Elizabeth Barber of the one known as Cherchen Man. Clad in finely woven woolens, he almost looks as if he could rise out of bed and begin another day in what must have been a difficult life. Cherchen Man has been dead for about 3,000 years. Though his lips no longer move, he speaks volumes about the first settlers in a bleak desert along China’s fabled Silk Road. Until a few years ago, he was the last man scholars would have expected to find there. Cherchen Man, along with dozens of other perfectly preserved mummies found in Turkestan, in western China, has stood archaeology on its ears. 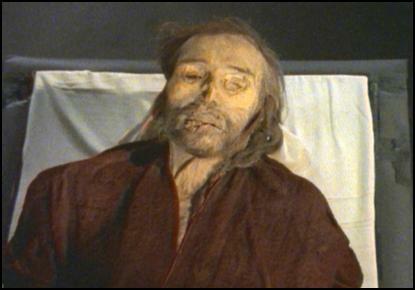 Although the mummies have been known to exist for decades, no one paid them much attention until 1987 when Victor Mair, professor of Chinese studies at the University of Pennsylvania, came across them while leading a group of tourists through an obscure museum in the town of Ürümchi (also spelled Ürümqi ). Mair was stunned, and not just because their clothing was perfectly preserved. The mummies, he believed, were Caucasian, with high-bridged noses, deep, round eye sockets, and fair hair. How had they come to be there, so long before any Westerners were thought to have crossed the Ural Mountains into Asia? The implications are profound, suggesting that Westerners may have influenced Chinese culture, which had been thought to arise independently of the West. Cherchen Man was found in a tomb with three women and a baby. How had they died? Why did they settle in a desert so severe that many have died traveling from one oasis to the next? Were they really from the West? Mair assembled a team of experts to see what the mummies could tell us. Among them was Elizabeth Barber, professor of archaeology and linguistics at Occidental College in Los Angeles. For Barber, author of a recently released book, The Mummies of Ürümchi, it was an opportunity she had been preparing for ever since she learned to weave at her mother’s knee. Barber and Irene Good, another team member, are among the world’s leading experts on prehistoric textiles. The stacks of clothing buried with the mummies were unlike anything seen before. “It just blew me away,” Barber says. For 13 years, Barber had rummaged through Europe from England to Iran, examining the oldest textiles she could find. Outside of Egypt, that consisted of just thumbnail-size fragments. Even those tiny samples yielded clues about the laborious chore of creating clothing. She learned what kinds of looms they used to weave which patterns, and what raw materials they used. So when she arrived in Ürümqi, she came with a wealth of understanding, but nothing had prepared her for what she saw. “It was like handling 19th century fabric,” she says. The mummies had been buried in a salt basin, and the salt kept the material dry. “The first thing that struck me was that it was all sheep’s wool, and that really surprised me. I had expected most of it to be plant fiber,” she says. Sheep aren’t indigenous to that part of the world, so those early travelers must have brought sheep with them from the west. The fabric patterns must have been woven on looms similar to those used to create the scraps she found in eastern Europe. That, along with other clues — grains of wheat were found in some tombs, and wheat is not indigenous to the region — was clear evidence that Cherchen Man was a product of Europe. So, too, were less well-preserved mummies of others found throughout the area, some of whom had died 1,000 years earlier. Why had they gone to that area, which even today is so desolate that few live there? How had they died? Unlike other tombs in the area, Cherchen Man’s final resting place was not designed to be reopened, Barber says. He was buried with the three women, one of whom is presumed to be his wife, and the tomb was sealed. A few weeks later, the baby’s body, also well preserved, was placed above the main burial chamber. The baby, about 3 months old, was wrapped in a bright red shroud. Alongside was a sheep udder fashioned into a nursing bottle. “It is clear that they (other members of the community) tried to keep the baby alive after the mother and father had died,” Barber says, so this wasn’t a case of killing the entire family so all could accompany the man into the next life. None of the mummies show any sign of violence. They apparently died, Barber surmises, from an epidemic. Still unknown, however, is why they were there in the first place. The "Il Ray" grazing routes of Iran, Iraq, and about four other nations to their NE and NW are reported to be 5,000 years old and run from the tribes Summer Pasture to their Winter Pasture. These tribes owned vast herds of sheep and goats, spun with drop spindles and wove on a system of poles for the warp and woof .. black tents were goat hair, their rugs were knotted and vegetable dyes were used. Their time lines cross the time lines of these mummies. I.S.U. History Dept. has a time overlay system that would be interesting to use in studying the Silk Road. Ref: "Tribal Rugs, treasures of the black tents - MacDonald."